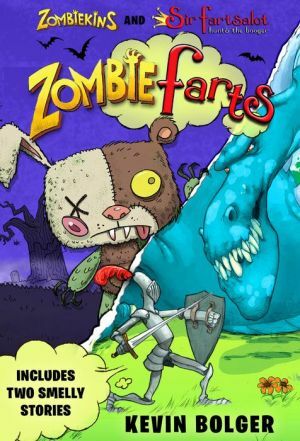 Kevin Bolger's hit middle-grade novels, Sir Fartsalot Hunts the Booger and Zombiekins, printed together in a single volume for the first time. Something stinks in the Kingdom of Armpit. Meet Sir Fartsalot: the bravest, boldest, and most, er, potent knight in all the land. He's on a quest to solve the riddle of the Foul West Wind, a ghastly odor that he's sure must be an omen of evil. When King Reginald of Armpit orders his troublemaking son Prince Harry to accompany Sir Fartsalot on his quest, Harry decides to play his biggest prank yet. He convinces Sir Fartsalot that a dastardly Booger is on the prowl, and that it's up to him to save the Kingdom of Armpit. Harry, Sir Fartsalot, and their buddy Sir Knotaclew set out on a hilarious quest to come face-to-phlegm with the dreaded Booger, and rid the world of him, once and for all! Zombiekins looks cuddly and creepy-cute--that's why Stanley Nudelman buys it from his neighbor, the Widow Imavitch. But he soon finds out that there's more to this bunny than meets the eye. Strange things start to happen if Zombiekins is exposed to moonlight--and when Stanley brings this terrifying teddy to school, he unleashes the worst zombie plague in fourth-grade history! Can Stanley and his best friend Miranda escape the grave danger they're in and save their schoolmates from eternal zombiefication? Or will they soon join the ranks of the snuggly undead?